This is a simulation of a boat crossing a river. Adjust the direction the boat is aimed, the boat's velocity relative to the river, and the river's velocity relative to the earth. Press the "Run" button to watch the boat's trip across the river. Questions to answer: 1) What direction should the boat be aimed to get to the other side of the river in the least amount of time? 2) What direction does the boat need to be aimed to get to the point directly across the river? 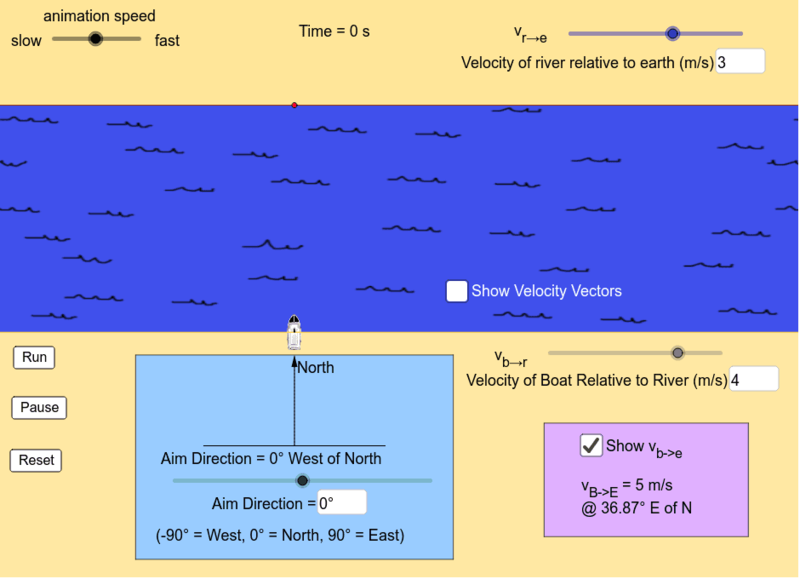 3) If the boat is aimed directly across the river, does the speed of the river's current affect the amount of time it takes the boat to cross the river?